Sample job application letter to apply for the position of financial accountant in company, school, college, university. My name is Lawrence and I am a financial accountant. I do have the experience. I used to work at a bank firm called royal bank of Scotland. This was my first job as financial accountant for three years. I was then working at two hotels as I needed to downsize have a smaller job. I am now looking for a bigger job. I do have the experience. I look forward to hearing from you. I am writing to you because I saw that you are looking for someone to hire as a financial accountant. I have previously worked as a financial accountant for a law firm and a small bank. I am good at math’s all my calculations I can do in my head I am very advanced in math’s I am good at working in teams. I would like this job because I would like to work in a bigger company so that I have a good chance to challenge myself. I am determined and motivated. I would like the chance to be very successful and make new long term friends. I look forward to hearing back from you. I saw your post for Financial Accountant in MCB bank On Linked In. I have been working in HBL bank as an Financial Accountant for last six years. I have worked in Other companies As well. With such great experience I think I will be able to fulfill the requirements you require for this job. I am very honest and energetic person. I am a good learner and have great experience. I have attached my Resume with this letter. With all this knowledge and skills hope you will find me fit for this position. 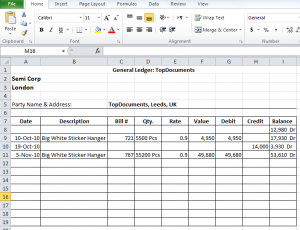 Sample General Ledger format in Excel sheet available as example for accounts department of companies, factories, import and export offices, small offices, production units to record the payments of customers and clients. 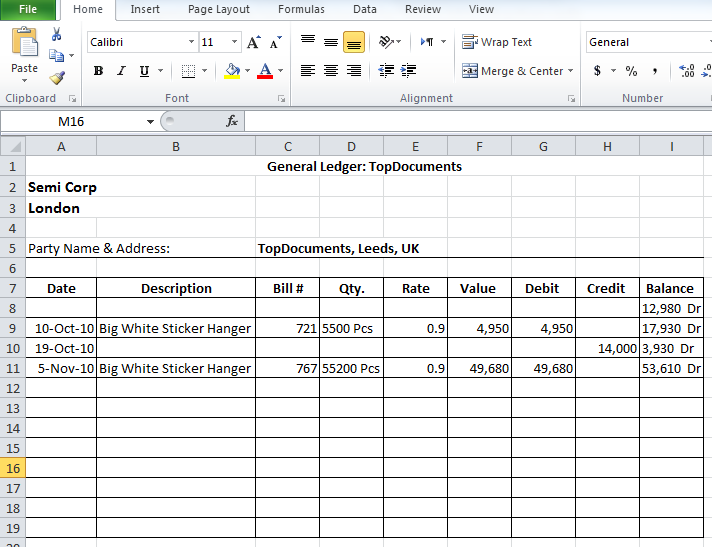 Please download the ledger file in excel format and put your company and client information in the header of the general ledger. In the below section we have few entries as example for your understanding. Please remove those entries and put your client transaction information into the ledger entries area. Any amount you receive will be placed in Credit and any amount remaining for payment you will post in into Debit section accordingly. Sample job application for accountant in English Language can be used for accounts manager, accounts officer, accounts executive and various relevant positions in accounts department or field. This job application for accountant can be send in email, on mailing address or as cover letter with resume. With Due respect, Purpose of this email is detail request for Accountant Job published at 15 May 20XX, I have done my MBA from University of Punjab and My professional background is basically in Accounts. 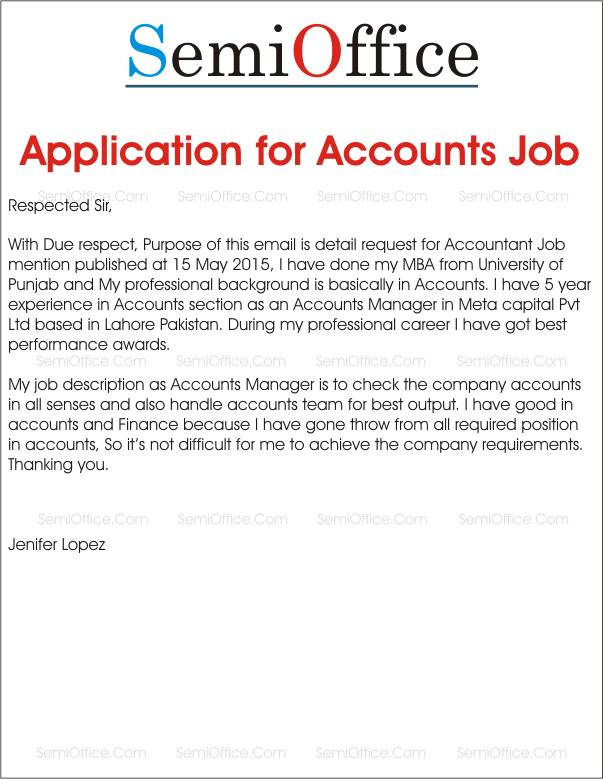 I have 5 year experience in Accounts section as an Accounts Manager in Meta capital Pvt Ltd based in Lahore. During my professional career I have got best performance awards. My job description as Accounts Manager is to check the company accounts in all senses and also handle accounts team for best output. I have good in accounts and Finance because I have gone throw from all required position in accounts. So it’s not difficult for me to achieve the company requirements. Thanking you. Please find attached my CV for the position in Finance/Accounts department. I have 06 years of experience in large group of companies in the field of finance and 01 year experience in accounts department. 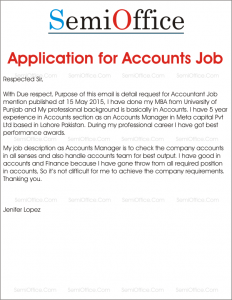 Job application letter for accounts job as accountant, assistant accountant, officer accountant etc with experience and without experience and qualifications of ACCA/CA/ICMA/CMA/CFA/B.Com, M.Com, Msc Accounts etc. I am Minahil student of ACCA final. I have passed successfully 10 papers and now looking for job in audit firm to gain some practical experience before completion of my degree. I am hardworking professional with pleasant personality and communication skills in English and Urdu/Hindi. My resume is attached with this email/letter for your kind review. I can provide references of my teachers if required as mentioned on your website. I am also prepared for final papers and waiting for the examination dates. I assure you that my studies will not affect my job except I will require four days off from work. Looking for your response. I have come to know through a reliable source that you are in need of an Assistant Accountant for your head office located in Al-Barsha Dubai. I would like to offer my services for this position as I completely meet the requirements of the position as advertised. Attached is my CV showing over three years of experience of working in Dubai at various positions in the Accounts Department. Also note, that I’m living just thirty minutes drive from the job location so my punctuality will also be ensured and I will be available to work even for late hours if required by the management. With all due respect I am writing this letter to inform you that I have applied at your firm as an accountant. I have come to know about this opening through social media. Sir, I have a strong grip on accounts and finance. I have worked for a bank and another firm. I have 5 years of experience in the relevant field. Please find attached documents and experience letters. As I am looking for new opportunities that is why I am leaving the previous job and I believe that I can grow well if I get a chance to work with you. I shall be really grateful. Sample resume format for accountant post available for free download. Just copy and paste the resume of your choice in Ms Word file and make necessary changes. Good example for education background in commerce, finance and accounts. House # 00, GULRAIZ MARKET BAZAAR MAIN LAHORE. A Challenging position in a dynamic organization in the field of Accounting and Finance, which provides relevant exposure, professional development and growth opportunities. First Position in BRAND Management and 2nd Position in Promotion, Human Resource Day, Innovative Product Concept with Chocolate Ingredients, Making the Innovation in reference of Brand Management. Will be furnished if required. To work in a challenging and growth oriented organization with the aspiration to give the best of my qualification and abilities in the field of “Accounting and Finance”. Utilities bills record and payments. Vetting of Postpaid and Prepaid New Connections. Reference and testimonials would be provided as required. To accept a challenging environment and initiate towards research and development in the working organization. To use my skills and capabilities to assist an organization in achieving its strategic and financial goals. 1 Year as Accounts Officer in H.Karim Buksh Enterprises. 2 Years as Accounts Officer in Pararmount Distributors. 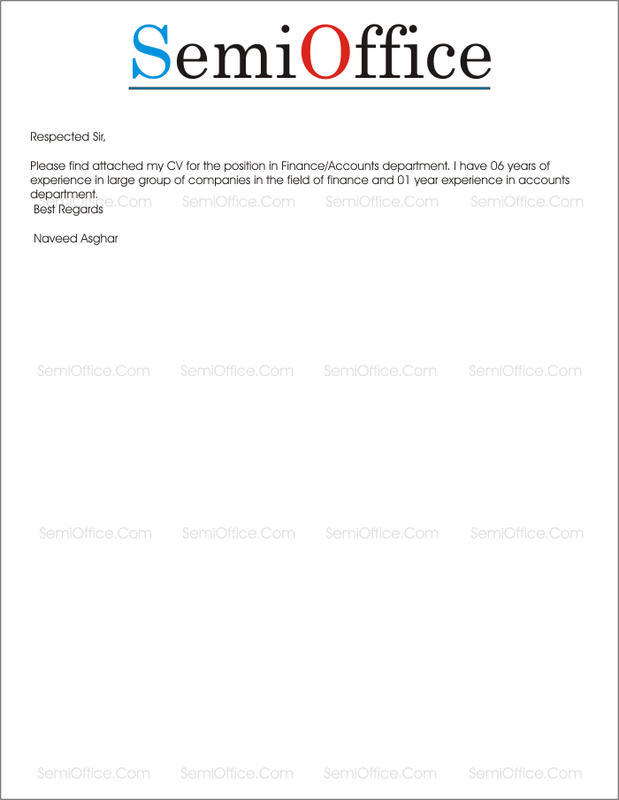 Sample Experience Letter for Accountant and Accounts Officers are available for free download and can be customized for Accountant, Accounts Executive, Accounts Officer and Company Accountant by changing names, designations and company information in the below letters. This is also known as Experience Certificate for accountant for all accounts jobs/posts/positions issued by employment companies, offices, small businesses and multinational companies. She gave importance to work above anything else and she proved herself as punctual staff working efficiently under workload. I am proud of working with her and hopeful for her better future. 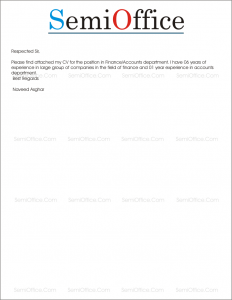 This is to certify that Ms. Saima D/O Mr. Jillani is a permanent employee of “Company Name”. He is working as accounts officer from November 01, 2016 to March 01, 2017. His gross salary is $15000 per month. This certificate is being issued on his own request. “Company Name” cannot be held responsible for any consequences arising from the use of this certificate.